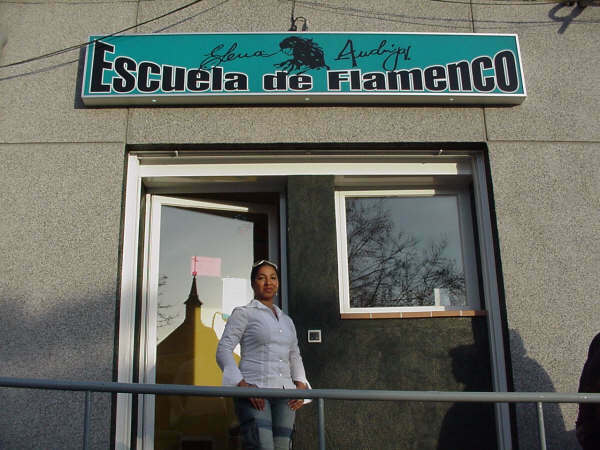 & 2-Day Flamenco Workshops In Dance, Singing, & Compas! Elena is Back! 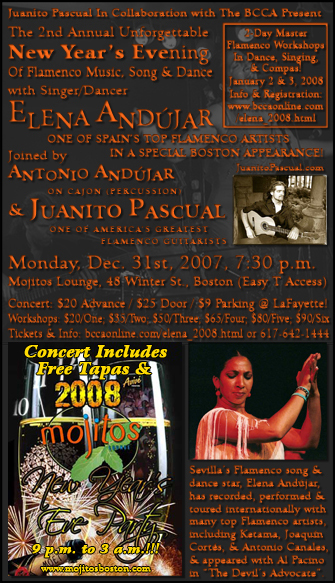 Elena And�jar returns for a special New Years Eve performance (Monday, Dec. 31, 2007) and rare two-day flamenco workshop! (Wed. & Thur., Jan. 2 & 3, 2008) Elena has quickly endeared herself to Boston audiences & flamenco aficionados after a triumphant Jordan Hall performance last summer and as a faculty member with Juanito Pascual's Summer Flamenco Institute at the New England Conservatory. She brings her magic and expertise to Boston for a few short days this holiday season-don't miss it! 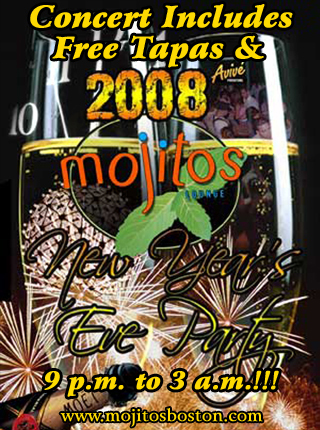 Monday, December 31st, 2007, 7:30 p.m.
12:00 a.m. - New Year's Eve Toast & Party Till 3 am! In Dance, Singing, & Compas! Wednesday & Thursday, January 2 & 3, 2008, 6:30 - 10 p.m.
Register by phone via credit card or check to guarantee your spot - (617) 642-1444. Day of (/ at the door) workshop registration will be available via cash, check, or credit card. 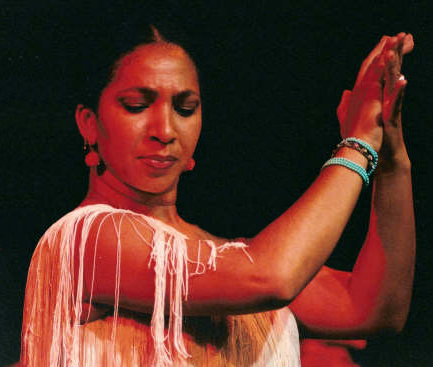 Learn the basics of the fine art of flamenco singing with Elena in this two day workshop. No experience required-but be ready to sing! 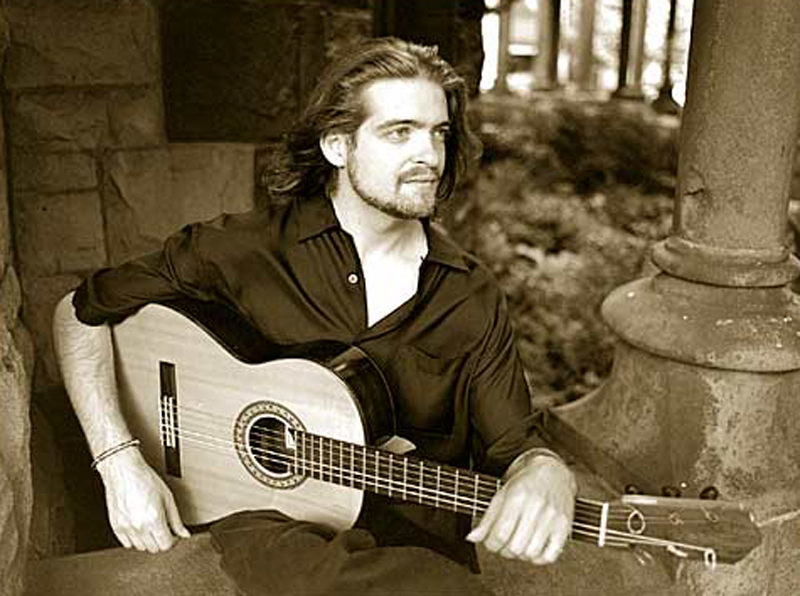 - With live Flamenco guitar accompaniment by Juanito Pascual! In the first hour Elena will cover essentials of technique and explore choreography in one of the traditional forms. The last half- hour will be intensive practice of rhythmic concepts together with the advanced students. The first half hour will be Intensive rhythmic practice focusing on Palmas and internalization of rhythmic patterns followed by one hour of technique practice and a section of advanced choreography in a rhythm to be determined.